Jennifer first got in touch with me when they were planning their 5th wedding anniversary trip to Banff. 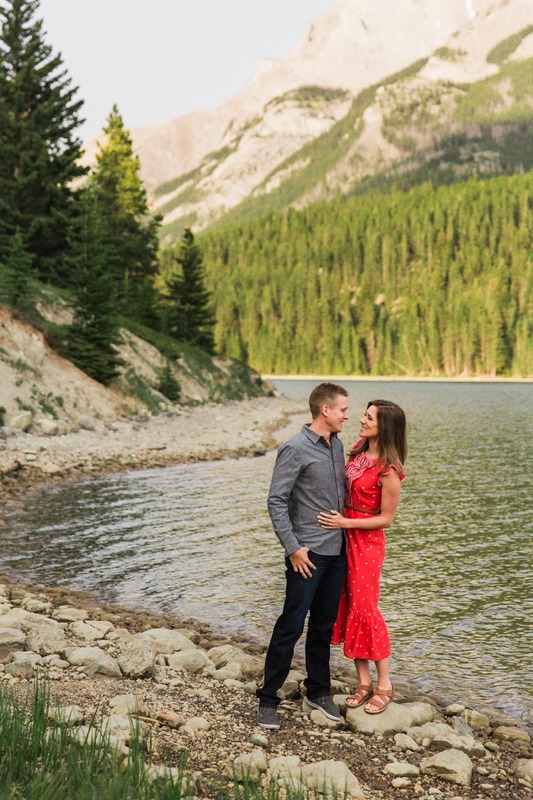 She knew she wanted photos to not only remember their trip by, but to also capture who they are in their fifth year of marriage, and is there a better backdrop than while your traveling to the Canadian Rockies? 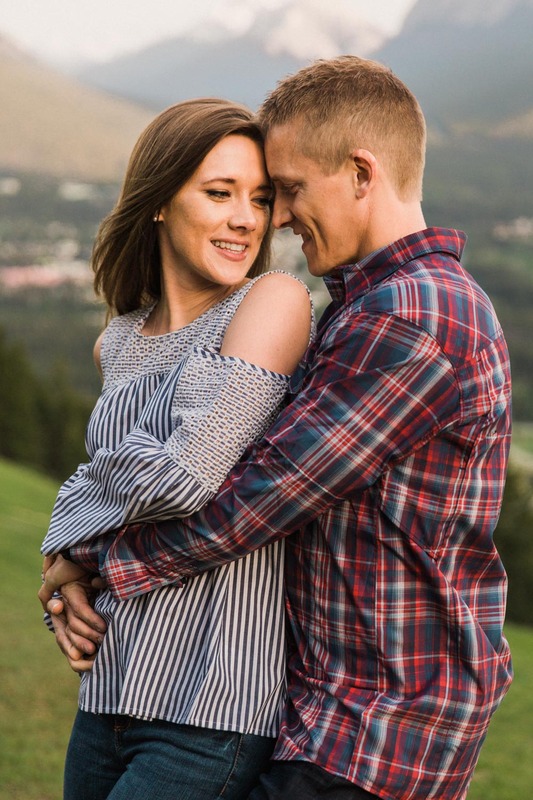 They traveled from Minnesota and I asked them all about their favourite places to visit here, the best food they had, the memories they made while they were traveling, and most importantly what they've learned over the past five years of marriage. They suggested some things in the Banff area that I haven't done yet and am immediately adding to my list! WHAT WAS YOUR FAVOURITE THING YOU EXPERIENCED WHILE YOU WERE HERE? It is so difficult to pick just ONE thing we loved. Our entire week in Banff and Canmore felt like a dream. Lake Louise and the hike up to the cute tea house was fantastic. Our horseback ride at Sulfur Mountain was so fun. It was about 3 hours on horseback, checking out some awesome views of Banff! The whitewater rafting tour on Horseshoe Canyon River was just beautiful. We saw several spots where movies were filmed such as The Revenant - very cool! Other than these activities, we had a blast taking our five year anniversary pictures! You made us feel so comfortable and we are so happy we were able to celebrate such an important milestone in our lives. ARE THERE ANY PLACES YOU ATE THAT YOU WOULD RECOMMEND? The Bison in Banff and The Sky Bistro were amazing. The Sky Bistro on the third floor of the Banff Gondola summit was delish & the views were unreal! Minnesota does not have mountains, so the views really take your breath away. WHAT ARE THE GREATEST MEMORIES FROM THIS TRIP THAT YOU'LL TAKE BACK HOME WITH YOU? In all honesty, just being in a beautiful place with my best friend is all I could ask for in an anniversary trip. I am not one to get sappy! Life is just moving so quickly these days and Banff/Canmore was the perfect place to spend quality time together. CELEBRATING FIVE YEARS OF MARRIAGE IS AMAZING. WHAT ARE A FEW OF THE BEST THINGS THAT YOU TWO HAVE LEARNED THROUGHOUT THE YEARS? This is a tough question! I feel as though we are constantly learning and growing as time goes on. Five years has gone by so fast! I know we are just at the beginning of our marriage, but there are definitely a few things we have learned in these five years. 1. I have heard a lot of people say a relationship should be 50/50 & we have learned that we both have to give 100/100. Giving all of ourselves to each other through every situation, whether good or bad - in joy and in pain. 2. Don't sweat the small stuff and give each other grace. Sounds so simple, but sometimes our expectations of what we thought life would be block us from the greatness that God has for us. Being present along this journey is more important than the destination itself. 3. Choosing to love, when it isn't convenient, fun, or easy. Showing up for the other every day, in really good times and most importantly the bad. Our society is starting to treat people as disposable & many people don't know what it is like to be loved unconditionally. When another person loves you when you aren't feeling lovable, it is the greatest gift you can ever be given. Oufits sourced from Boden and Nordstrom Rack.